Compatible components for Intel’s Next Unit of Computing (NUC) are slowly starting to take root as the small form factor standard gains market share. 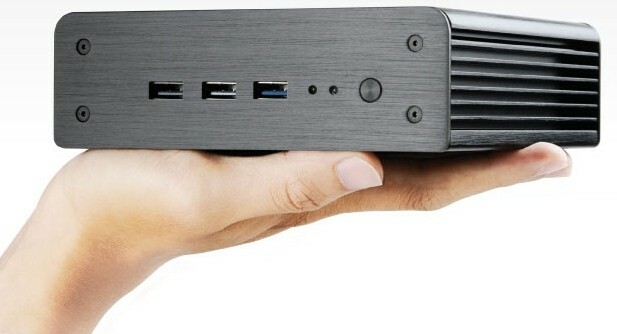 Akasa’s latest NUC chassis – the Newton V – is a perfect example of this as the innovative fanless design more resembles a car stereo amplifier than a full-fledged computer case. The 2.1-pound chassis was first shown off during Computex back in June. It measures 5.9 inches x 5.9 inches x 1.8 inches and may seem a bit heavy for an all-aluminum design but it’s important to remember that it’s essentially one giant passive heatsink. It’s designed to work in conjunction with Intel’s D53427RKE motherboard, a barebones unit that includes a soldered-on Core i5-3427U dual-core processor clocked at 1.8GHz. The board supports up to 16GB of DDR3 RAM and carries an HDMI port, two mini DisplayPort connectors and a Gigabit LAN connection. Physical expansion slots include a PCI Express Half-Mini Card connector and a PCI Express Full-Mini Card connector, we’re told. Elsewhere, the Newton V includes front-facing USB 3.0 connectivity. Thunderbolt support is out of the question, however, as these NUC boards from Intel don’t support the high-speed interface. The case can act as a standard tabletop unit or can alternately be mounted on a wall or out of sight using a VESA mount. One could even attach the system to the backside of their monitor for an all-in-one type solution or tuck the unit away behind a television for HTPC usage. Akasa hasn’t released pricing information on the Newton V just yet but with any luck, it’ll be comparable to other solutions already on the market.